The all-new Subaru Ascent Family hauler could prove to be popular with expectant moms. See what Swapalease found out in a recent survey. Thousands of drivers across the country were asked about their preferences on vehicles for new moms. The nations largest online lease company, swapalease.com, recently released results of its “New and Expecting Moms” survey, where safety is the most important factor. The new Subaru Ascent set to hit dealers this summer, could be positioned perfectly with expectant moms. Here’s why. The majority of those polled (32 percent) say mid-size SUV’s are the best vehicle type for expecting moms. Most believe that performance and safety rating (34.8 percent), followed by style and design (31.6 percent), are more important than space and storage (19.6 percent) and 3-row seating options (14 percent). Respondents also said safety rating (65.4 percent) is more important to them than budget or price (34.6 percent). It can be concluded that expecting moms today opt for safety, style, and design of a new vehicle over the practicality of accessibility and space. This could bode well for Subaru’s all-new 2019 Ascent family hauler that will likely be the safest SUV on the market. Here’s the data. The 2019 Ascent will be the first Subaru to come standard with EyeSight Driver Assist Technology that includes Automatic Pre-Collision Braking, Adaptive Cruise Control, Lane Departure and Sway Warning, Pre-Collision Throttle Management, and new EyeSight Assist Monitor (EAM) which provides a heads-up display of the EyeSight system warnings as well as system status information on the windshield of the vehicle. Ascent Limited and Touring models will also come standard with new Steering Responsive Headlights. The 2019 Ascent will be available with even more safety tech. The Ascent 3-Row also offers available Blind Spot Detection with Lane Change Assist and Rear Cross Traffic Alert, High Beam Assist, and Reverse Automatic Braking. The top-trim Touring model will also come standard with a new Front View Monitor that displays a 180-degree view of the front of the vehicle on the multi-function display by using a camera located in the front grille. Also standard on Touring will be a Smart Rear View Mirror which displays a view from behind the vehicle from a camera mounted above the rear gate glass, when activated. This feature benefits the driver in poor visibility to the rear of the vehicle due to passengers or cargo blocking the view. The all-new 2019 Subaru Ascent will be subjected to the same stringent IIHS safety crash tests once it arrives next summer. Look for the 3-Row family hauler to be one of, if not the safest new Mid-Size SUVs in America with standard EyeSight, Steering Responsive Headlights, and a host of other safety features. 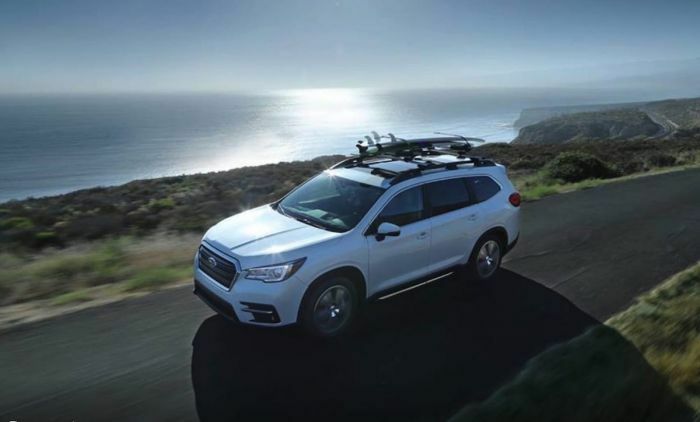 Subaru safety will continue to be a focus with the new 3-Row Ascent because of the new architecture underpinning the all-new 2019 Ascent. The new Subaru Global Platform improves crash energy absorption by 40 percent over present models keeping occupants safer in the event of a crash. Subaru could be positioned perfectly with expectant moms because of its safety and pricing. Over 65 percent of those polled said that a new mom should spend between $30,000-$45,000 on a new car, while just 16 percent said they would spend $46,000 or more, and 19 percent said they would spend less than $30,000. This is right in the new Ascent’s price range. The U.S.-built 2019 Subaru Ascent available in base trim starts at $31,995, while the top trim Ascent Touring is priced at $44,695.